There is nothing better than a Saturday all to your own. I set out mid-morning and arrived back to my hotel in the early evening, wearing a big smile and feeling more calm, cool and collected than I have in a while. The day was a beauty, a true gift from the universe--the sky so blue, the air cool and crisp. The kind of day that just makes you sigh. 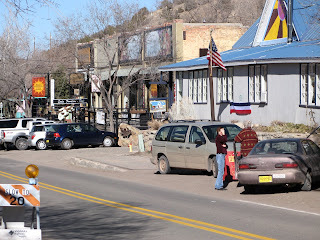 I decided to take New Mexico Route 14 north to Santa Fe, otherwise known as the Turquoise Trail. I'd not been this way before and enjoyed the drive so much I headed back to Albuquerque the same way. I'd passed through the small town of Madrid on my way to Santa Fe truly on a blink. I was determined to stop there on my way back. The colors of New Mexico always surprise me. I suppose all the brown and red and earth tones are there on purpose...so the colors that those who live there choose to decorate the place with have the perfect backdrop to make the colors pop! 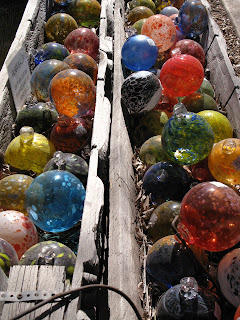 I loved these blown glass balls in a weathered trough. Just one of the treasures I discovered along the way. I've documented a bit of my trip for you. Would that you had been riding along side me in the passenger's seat, this is the kind of terrain you would see on our way. 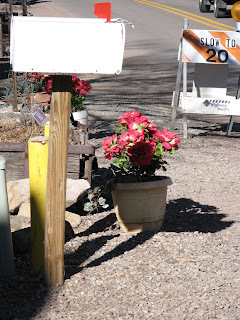 Once I'd arrived in Santa Fe, I spied a Jackalope sign. I've heard of the place. There is one in Albuquerque and Bernallilo and in LA, I believe. Look at all the pretty baubles! ...but I have to say that I was disappointed with the amount of China and India imports, expecting more Southwest. They were beautiful, of course, and highly priced. 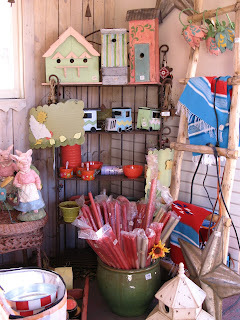 A bit out of reach for this do-it-yourself, yardsale reinventor kind of gal. But I got PLENTY of ideas. 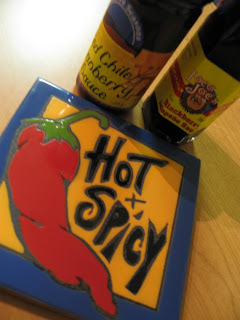 I lunched on local Mexican cuisine, Chile Rellenos, and brought half of it home for my dinner. Yum. 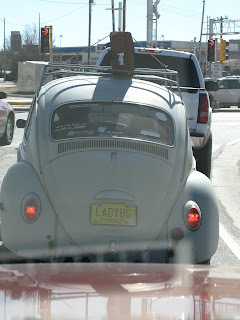 Side note: While heading out of Santa Fe, I passed this vehicle and had to smile. See that suitcase strapped to the top? Across its side is written "Emotional Baggage." LOL I tried to get a side view pic but alas, the little bug was too quick for me. I did make my stop on the way home in the teeny tiny little community of Madrid. I think when I grow up I'll run away to live there. Very artsy and laidback. I got the feeling that this may be the place old hippies go before they die. Or, maybe they've been there since 1968. Not sure. At any rate, it's kinda cool and I had fun roaming a few shops and talking with the proprieters. 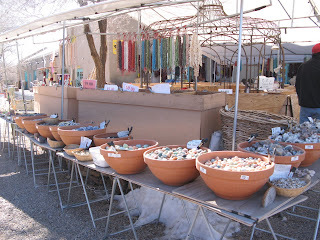 For all the brown in New Mexico, this place was like a splash of rainbow plopped down on either side of Route 14. Oh yeah...and I did make one purchase. Nice, huh? 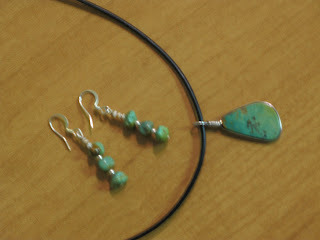 Turquoise from the Turquoise Trail. Why not? So then I headed home (er, hotel). Back toward the Sandias and Albuquerque. What a lovely day. Thanks for coming along with me! Love this post, Maddie. Terrific pictures! 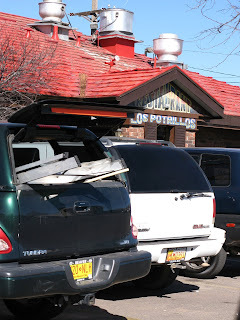 The image I have stuck in my memory of New Mexico was a cross-country trip from California many years ago. The approach to Albuqueque happened just at sunset. The desert floor was a blaze of red sand with the city in the distance like a solitary shining beacon in the middle of a Martian landscape. Absolutely breathtaking. Oh, how very very cool! I so enjoyed the pictures and the play-by-play of your adventure. The part of me that is desperate to travel is living vicariously through you. Thanks!! What a fun trip--thanks for taking us along! When I was in Albuquerque, a hot air balloon race was occurring. Those gorgeous colors against that big sky--amazing! Thanks for coming along, ladies! I hope you enjoyed. It was a good day. Today I'm holed up in the hotel room for most of the day catching up on day job work and finishing revisions on my upcoming release! Hope your Sunday back in KY is good...and not so cold! Loved the pictures and video. Very cool...made me feel like I was right there with you. Love the earrings and necklace- beautiful! Very cool. Love the blown glass in the troughs.